Mike Press and I were at the One Public Sector Expo in Edinburgh today, running a workshop on Design Thinking for Public Sector Innovation. We introduced the RIP+MIX method, enabling around 40 participants from the Scottish Government, the NHS, business and the voluntary sector to think creatively about the ‘pain points’ in their roles. In a keynote talk Professor Jason Leitch, Clinical Director, The Quality Unit, Scottish Government (and Honorary Professor here at Dundee) told powerful stories about supporting chaotic families towards stability by co-locating services to dovetail foster care, drug rehabilitation and early years care. 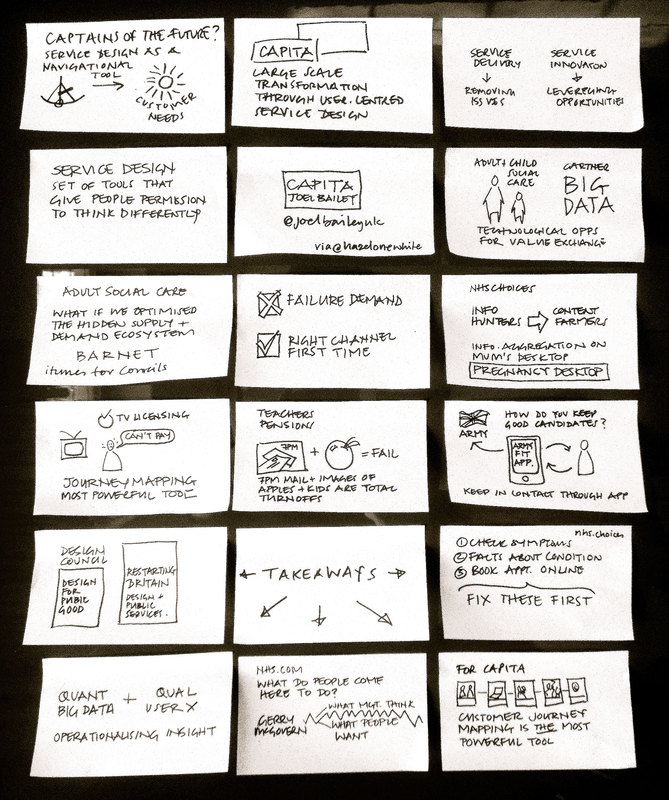 Joel Bailey, Service Design Manager of Capita ran a masterclass on Large Scale Transformation through User-Centred Service Design – my notes and takeaways are illustrated below.